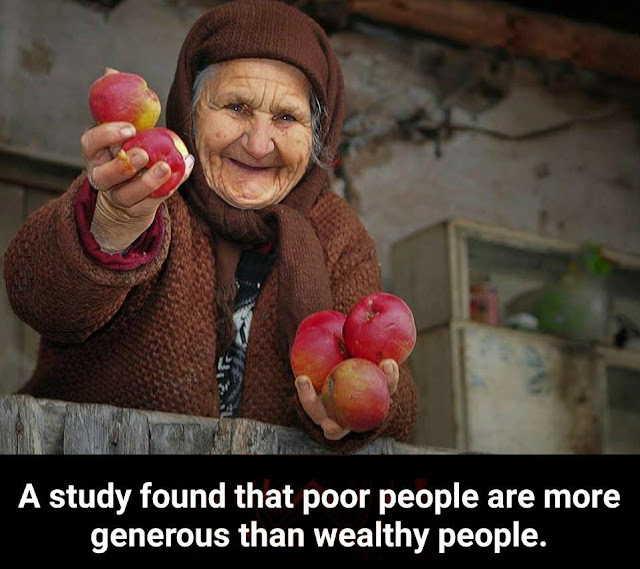 Why Are the Poor More Generous? Subject: Fw: Why Are the Poor More Generous? A PhD candidate at Berkeley, Paul Piff, recently repeated that finding - and more: "lower-income people were more generous, charitable, trusting and helpful to others than were those with more wealth. They were more attuned to the needs of others and more committed generally to the values of egalitarianism." It's tempting to think that the rich are richer because they are more selfish or single-mindedly focused on their own advancement, but Piff's research suggests otherwise. His experiment primed subjects by showing sympathy inducing videos and encouraging them to imagine themselves in different financial circumstances. That changed their reactions -- for both sets of subjects. In other words, the poor, imagining themselves rich, became less altruistic. The rich, imagining themselves poor, became more generous to the destitute and ill. Piff concluded: "Empathy and compassion appeared to be the key ingredients" in the generosity of the poor.